The Kali begins its journey high on the Tibetan plateau in the Kingdom of Mustang. 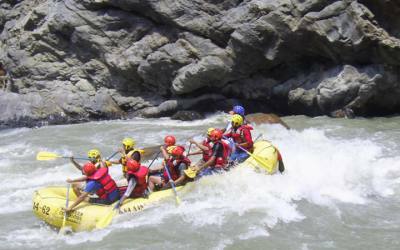 Plunging its way down through the Himalayas, the river carves the deepest gorge in the world between the two 8000 m peaks Dhaulagiri and Annapurna. 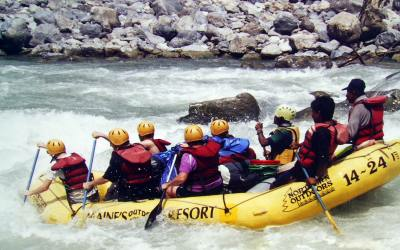 A deservedly popular medium length river trip combining exhilarating white water with fine scenery. This is the perfect river for the advanced intermediate expert Kayakers. 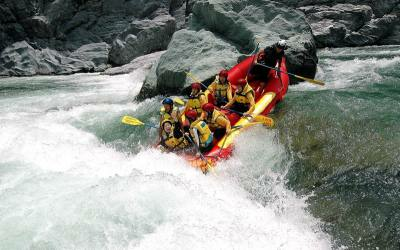 The majority of the rapids are pool-drop with great surfing and hole riding. Experienced safety kayakers accompany each trip offering, advise on rapids and tips on improving your technique. A good roll is a prerequisite. One of the ten best River trips in the world. 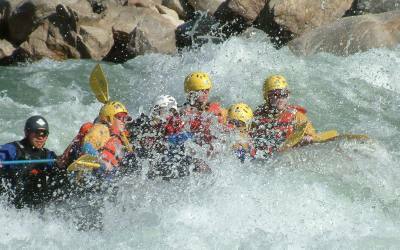 Big rapids, warm water, beautiful scenery and great camping make it a classic multi-day river expedition. 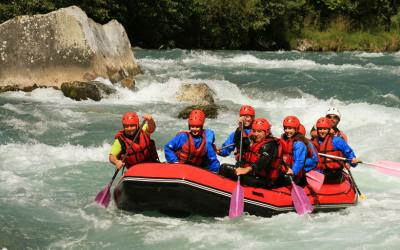 A great trip for advanced / intermediate and seasoned kayakers. Day 01: 7. 30 am meet at Hard Rock Sales Office - store extra luggage. Breakfast, (not included). Drive Beni 3 hours. Unload gear eat lunch and load rafts. Safety briefing - depart. After a brief warm we encounter 2 big class 4 rapids "little Brother" and "Big Brother". 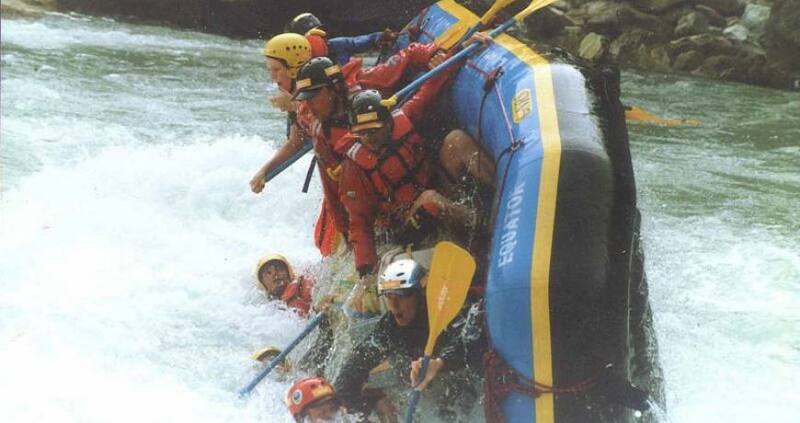 After scouting the rapid’s safety kayaks will descend followed by the rafts. 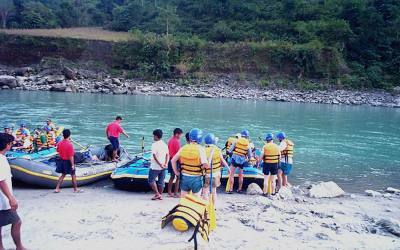 The confluence of the Modi Khola marks arrival at the evening campsite. Unload rafts one team prepares dinner whilst the others relax, take in the scenery or play volleyball. Day 02: Plenty of adrenaline and spectacular scenery. 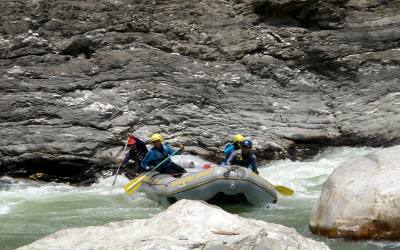 Views of Annapurnna 1 and Himachuli are interspersed with continuous class III sections of river, culminating with the challenging class IV rapids, "Refund" and "Tombstone". Lush vegetation and spectacular waterfalls cascade down cliff faces and lead us to camp at the village of Purti Ghat. Day 03: Upon reaching the holy village of Seti Beni team members have the opportunity to take photo’s of the Kali Gandaki’s biggest rapids and this sacred Hindu temple. Not long after this the journey comes to an end. Bus to Pokhara.